See yourself for who you truly are. 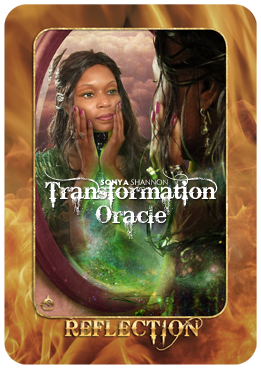 Read about Mirrors in the Transformation Oracle Deck. Reflection helps us come to terms with our strengths and weaknesses. We admit our habits—good and harmful. The REFLECTION card is number 4 in the FIRE element (chart on page 65 of the Guide Book). It’s a necessary stage in so many spiritual processes, including meanings inside the cards for FORGIVENESS, IMMIGRATION, and STUCK. As important as it is to look at our shadow aspects, true reflection involves looking equally at our goodness, inner beauty, and strengths. Most of us have distorted images of ourselves. We see ourselves as better or worse than we actually are. If our self-image is unbalanced, we tend to see others as better or worse than we are. This kind of “vertical” evaluation means that one person always has to be “good,” while another is “bad.” Honest reflection means seeing that everyone—starting with us—has both light and darkness…which means that everyone is on the same level! If the REFLECTION card appears upside-down in your spread, your bias for or against yourself is preventing you from resolving the situation in your question. Check the other cards or pull a new one to learn how you can become willing to have a more realistic view of others—starting with yourself.